Additional Info: Uganda’s star attraction is the endangered mountain gorilla, the bulkiest of living primates, and among the most peaceable. Known for its Gorilla Safaris, Uganda allows the eco-traveler a view of humbling wildlife when with an expert guide takes you on a tour through the Bwindi Impenetrable Forest, you can come across a family of mountain gorillas, for example. Bwindi Impenetrable Forest, largely contained within Bwindi Impenetrable National Park, comprises a large primeval forest in East Africa. It is one of the most biologically diverse areas on earth, where half the world's population of the highly endangered Mountain Gorilla live in its jungles. Kibale National Park is a national park in western Uganda protecting moist evergreen rainforest. 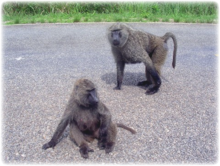 The park adjoins with Queen Elizabeth National Park and is an important ecotourism and safari destination, popular for its population of habituated chimpanzees and 12 other species of primate. 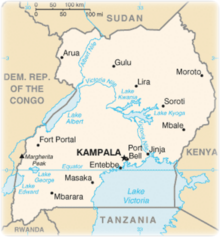 It is also the location of a biological field station managed by Makerere University. Kibale guides trek in this forest every day and many have helped researchers in their work. These expert guides know the life history of many of the different animals and can teach you about such behaviors as communication between chimpanzees. The Queen Elizabeth National Park is Uganda's most-visited game reserve. It lies in the west of the nation and occupies 2,000 sq. miles from Lake George to Lake Edward around the Kazinga Channel connecting them. The park is known for its wildlife. It is now home to 95 species of mammal and over 500 species of birds. This park includes a remarkable variety of ecosystems from semi-deciduous tropical forests to green meadows, savannah, crater lakes and swamps. Within the park a vast array of wildlife can be found including elephant, buffalo, hippo, leopard, hyena, bush hog and the famous tree-climbing lions of Ishasha.